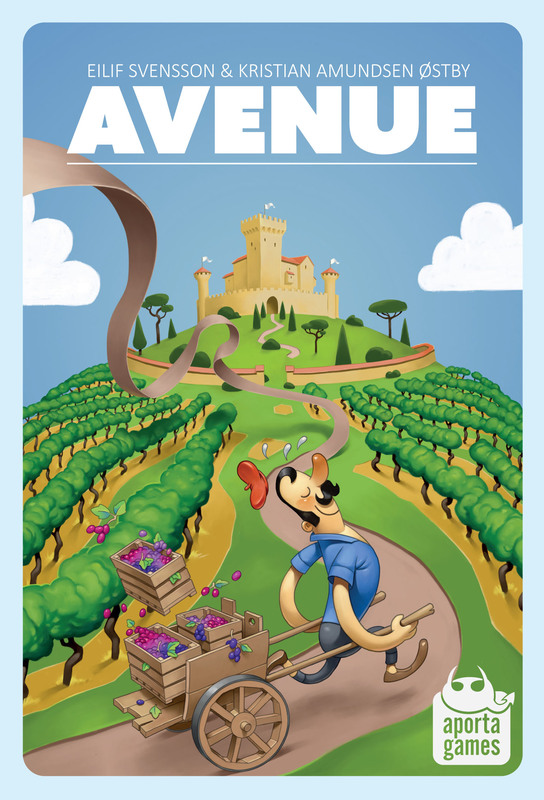 In Avenue players are harvesters, picking grapes and delivering the yield to the neighboring farms. Being provident, prudent and pushing your luck is all needed to bring the game to a fruitful end. Setup for Avenue only takes a minute. 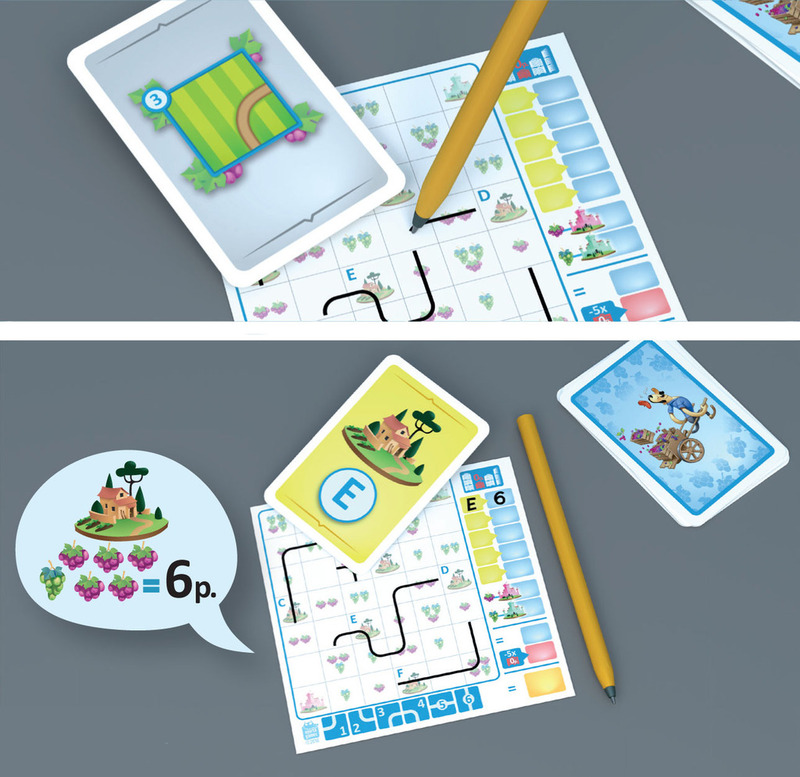 All players get a pen and a small sheet of paper with a 6×7 grid on it. The grid is filled out with clusters of purple and green grapes, 6 farms (A to F) and 2 castles (purple and green). On the right of the grid is your score track. Underneath the grid is a reference table showing the 6 types of road segments. The farm cards and 42 road cards are placed in two face-down decks in the middle of the table. 2) peek at the next farm up for scoring and don’t draw anything (allowed only once per round). Out of the 42 road cards 20 are grey and 22 are yellow. After the 4th yellow road card has been placed on the table the round ends and the earlier revealed farm gets scored. Each grape, no matter the color, connected to the farm is worth one point. There’s a catch however! When your harvest is equal or less than in the previous round you need to write 0 in your score box and will suffer a 5-point penalty at the end of the game. After 5 rounds the game ends, the 6th farm gets discarded. All players count up the number of purple and green grapes leading to the similar colored castle and add this to their score. The player with the highest total score is proclaimed the winner and the player sheets will most likely travel around the table for rigorous study and animated discussion. It won’t be long before someone asks “shall we have another go?”. Avenue is one of my favorite filler games. It’s portable, it’s fast, it’s challenging and supports a high player count. The fact that it’s card driven makes it quite a strategic game. There are 42 road cards depicting 6 types of road segments; that means 7 cards of each type. Throughout the game you can easily keep track how many cards of each road type are still left. Long term planning is needed if you don’t want to get stuck with no way to turn. The length of a round can vary a lot, depending on how fast the fourth yellow card pops out from the road deck. This adds a huge amount of tension as you need to contemplate whether to go for the immediate win or take a risk and build up for future rounds. Forcing you to score higher each round, momentary greediness might backlash, but lasting precaution will likely kickback. Avenue is a solitaire puzzle, but it creates a nice buzz and vibe at the gaming table. Players will jubilate and cry out in despair, utter silent prayers and curse out loud. Avenue lies in the escalated scoring and the depleting road deck. The game can both be played casual or calculated depending on the gaming group.